The main thing you need to know about multiple Shamus Award winning novelist Reed Farrel Coleman is that he is a fellow Mets fan. For that reason alone, I’m happy to turn the blog over to him for the day. Special note to New York readers: the launch party for Reed’s latest Moe Prager book Hurt Machine is tonight at The Mysterious Bookshop at 7 PM. Go and commiserate with Reed about Jose Reyes donning a Miami Marlins uniform. To date, I’ve only sold the movie rights to one novel. That novel, Tower, co-written with Irish author supreme Ken Bruen, was, until now, the only standalone novel I ever did. Ken’s agent swears the movie is going to get made. Believe me, no one hopes it does get made more than me, but I’m not spending the cash just yet. For now, I’m happy with the option getting picked up. 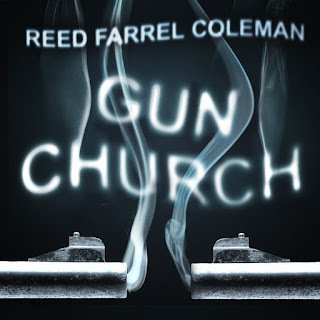 My second standalone, Gun Church (Audible.com, Nov 2011) is also a book I think has potential movie legs. Why? Because unlike some of my other novels, it played in my head as a movie and was written as if I were simply putting into words the movie in my head. In fact, its first incarnation is not as a traditionally published novel at all, but as an exclusive audio download. The novel is more performed than read by two voice actors/narrators. Kip Weiler is a former 80s literary wunderkind. As a result of his own foibles and insecurities, he’s fallen on hard times and is twenty years removed from his last novel. He’s exiled to a rural mining town, teaching creative writing at a community college. One day, Kip saves his class from a potential blood bath. Because of his heroics, he gets a second fifteen minutes of fame and, more importantly, the urge to write once again. Little does he know the book he is writing may be the blueprint for his own demise. He gets deeply involved with two of his students and a cult-like group obsessed with the intrinsic nature of handguns. Things really get weird when art starts imitating life imitating art. Think: Wonder Boys meets Fight Club with guns. 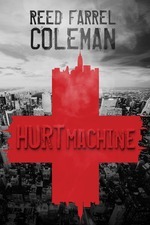 And for the first time in my career, I have another novel, Hurt Machine, the 7th in my Moe Prager Mystery series, coming out at roughly the same time as GC. Two novels at once. The thing is, they couldn’t be more different than one another had I tried. Oddly, Hurt Machine is no less cinematic than GC. Because in HM there is both an internal and external struggle that dovetail in the end. Moe Prager is two weeks away from his daughter’s wedding when he receives grave news about his health. To make things worse, Moe’s ex-wife and former PI partner, Carmella Melendez, shows up after a nine year absence asking for a desperate favor. It seems her estranged sister has been murdered outside a popular Brooklyn pizzeria, but no one, not even the NYPD, acts very interested in finding the killer. Why? That’s the question, isn’t it. So it’s strange for me to have these two pieces of my work floating around that have movie potential. We’ll see. Called a hard-boiled poet by NPR’s Maureen Corrigan and the noir poet laureate in the Huffington Post, Reed Farrel Coleman has published fourteen novels. He is the three-time recipient of the Shamus Award for Best Detective Novel of the Year and a two-time Edgar Award nominee. He has also won the Macavity, Barry, and Anthony Awards. Reed is an adjunct professor of English at Hofstra University and lives on Long Island with his family.